There’s not a lot of variation in the pictures this week. It’s still all about the kitchen! The end really is in sight now and gradually we are able to do more and more in the kitchen, although we still haven’t got a working hob or sink. 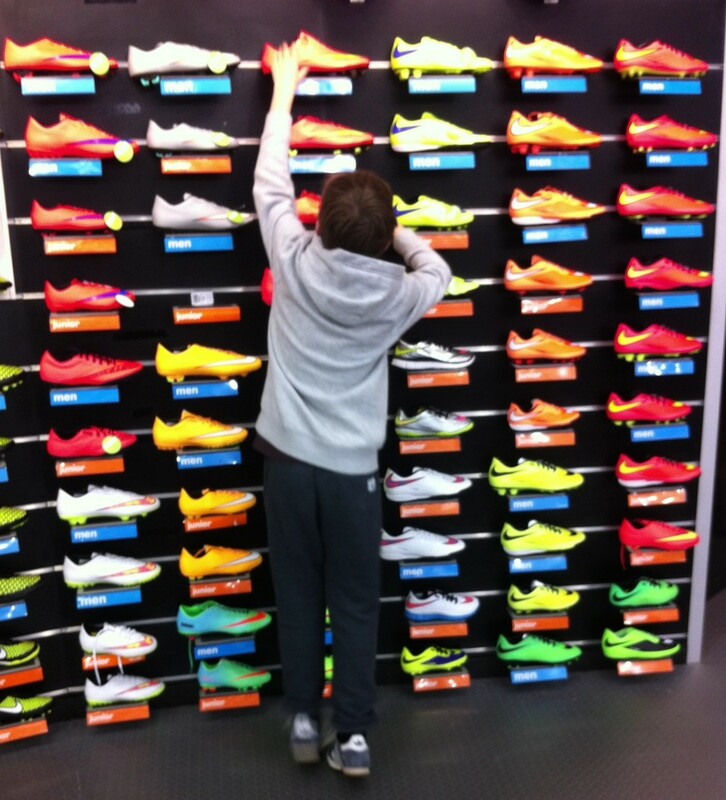 Day 102 – Sunday 12th April – my son’s football boots split in two at rugby, so we needed to get some new ones. He was in paradise surrounded by all these boots. He went for a pink pair, but decided we would call them ‘orangey-red’. Would you believe they’re size NINE? He’s only 11! 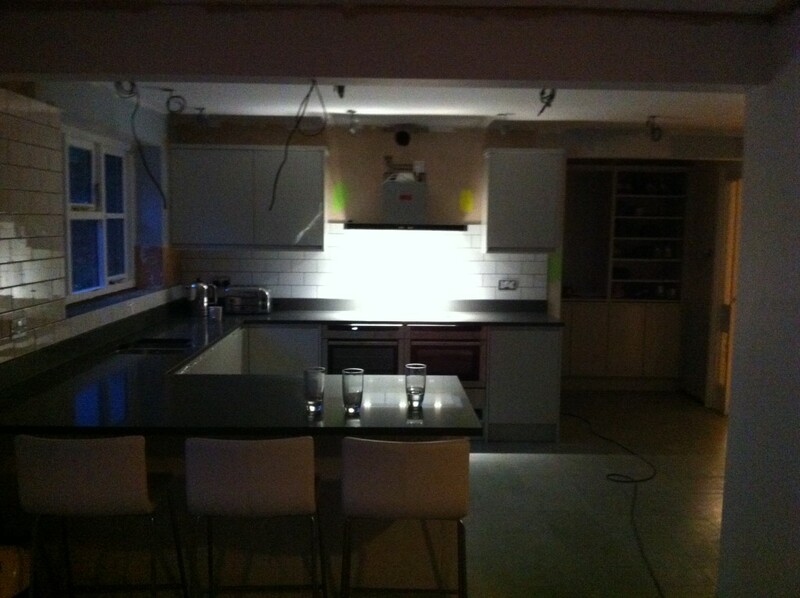 Day 103 – Monday 13th April – the kitchen continues to make good progress. This is what our patio looks like during the day! 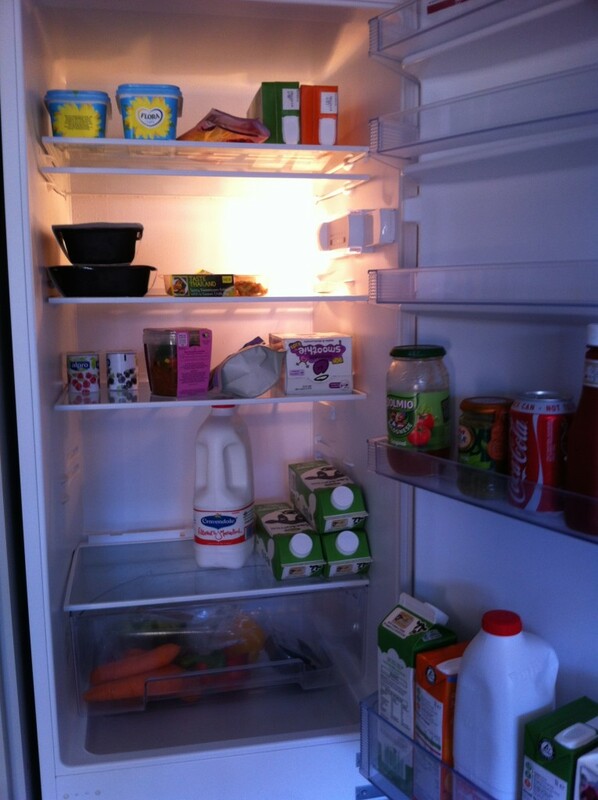 Day 104 – Tuesday 14th April – we have food in the new fridge! Yes, there is still quite a high proportion of microwave meals. 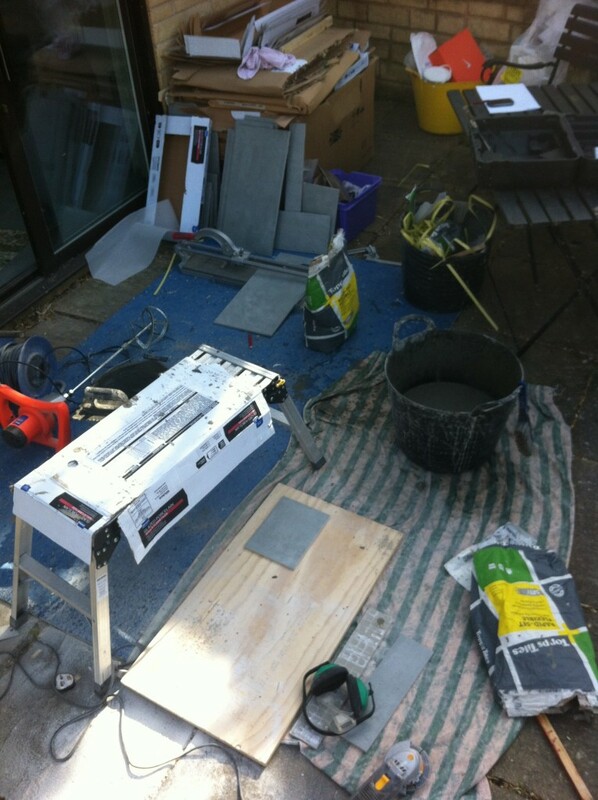 Day 105 – Wednesday 15th April – the work surfaces were fitted today. It’s amazing how that suddenly makes the kitchen feel much more like a kitchen (even though we still haven’t got lights, wall tiles or a working sink!). Day 106 – Thursday 16th April – not a very good photo (in fact a pretty bad one) – taken in low light (because we don’t yet have lights) on my phone. You can just see where we’ve been testing colours for a feature wall and we have some tiles! 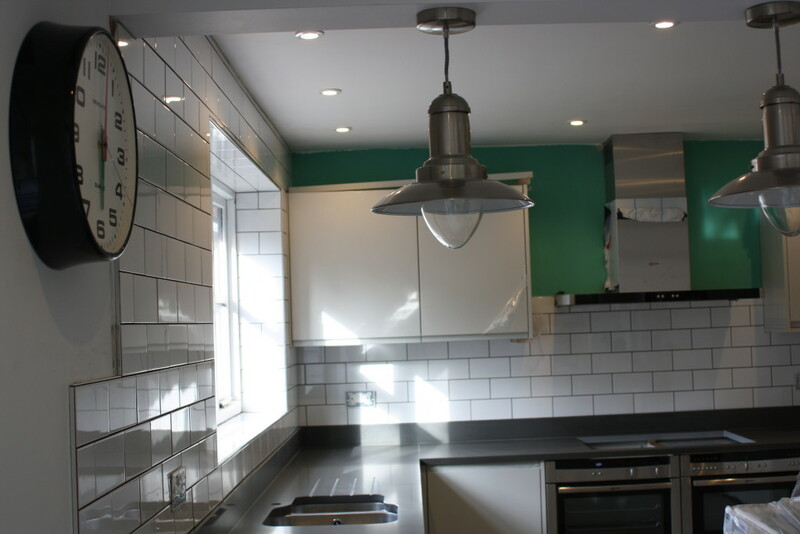 Day 107 – Friday 17th April – the lights are in and the tiling is complete (just the grouting to go). The kitchen looks amazing! Day 108 – Saturday 18th April – and just because I can, some more kitchen spam! Your kitchen looks utterly gorgeous 🙂 And wow to that wall of football boots – what a great colour selection! Thanks very much, I’m so pleased with the kitchen! No black or white boots all. Oh wow the kitchen is looking amazing. I love the breakfast bar around the side. Thanks very much, I’m really pleased with it all. Thanks, we’re really pleased with it! 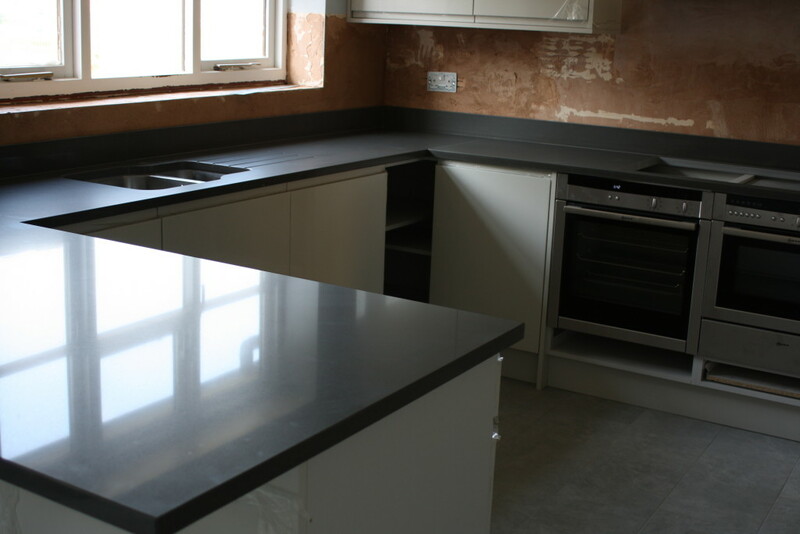 We especially like the work surfaces (although they’re so shiny they need cleaning constantly!). Thank you! The colour is one we used in my daughter’s bedroom. We had a bit leftover and it works perfectly! Thank you! Those are all my favourite bits and I love where they all meet. It’s looking fab Sarah! Love it. You must be so pleased 🙂 Are those the same tiles as you’ve got in your bathroom? Thank you, we’re really pleased! Yes, they’re the same tiles we’ve got in our bathroom, well spotted! Wow your fridge looks huge and I love your shiny new worktops. I bet it’ll all look almost finished this time next week! Huzzah!!! The kitchen is complete and it looks gorgeous Sarah! you must be thrilled and so happy to start cooking in it! well worth the wait and the hassles. Thanks very much, I’m so pleased! I reckon I’ll soon forget about the extension cables, microwave meals and mini hob! Love love LOVE your kitchen, its nearly finished!!! Wow it’s really coming together now isn’t it? Very nearly there. Must be so nice to see it nearly done. Always great with a project to follow! And it’s going to look fabulous. Your kitchen is looking fab – I am very jealous! 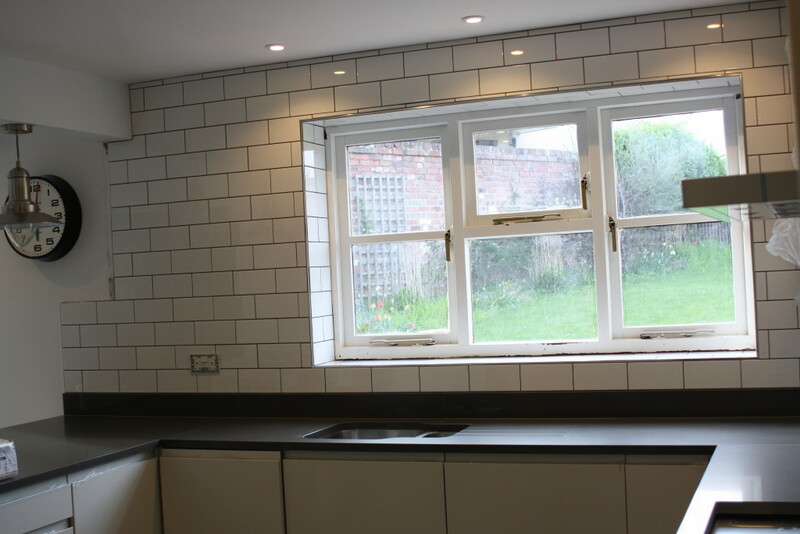 the finished kitchen will be a relief -it all looks fabulous. Love all the lights, my kitchen sadly lacks in them. I spot lacto free milk in your fridge – I use it to make my yoghurt with, makes better yoghurt than soya milk.